This article covers the initial set up necessary to use Tuition Express. You’ll start by configuring overall settings such as your Tuition Express Account Number and payment descriptions. Then move on to Security Settings. The steps outlined in this article will be handled during your initial setup call with a Tuition Express representative. Normally you’ll receive a call from us within 1-2 days after receiving your Tuition Express packet or contact Tuition Express directly at: 1 (888) 419-5033. If you prefer, you can configure the overall Tuition Express settings on your own (see below). The Tuition Express Video Series covers everything you need to know to set up and use Tuition Express in short, easy lessons. 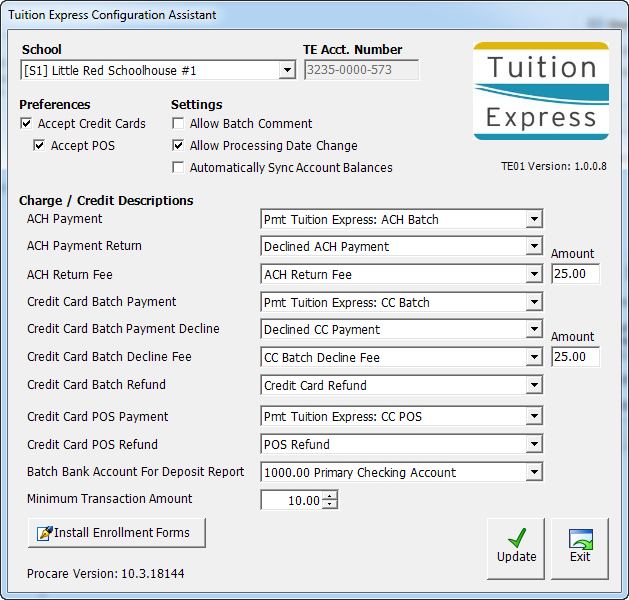 Download the Tuition Express Configuration Assistant (recommended). See below. 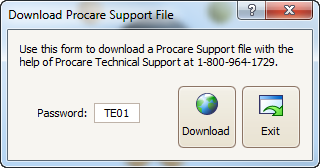 From the Procare Home screen go to Utilities > Download Procare Support File. Enter a password of TE01 and click Download. Choose the School location for this Tuition Express Account (top left). If you have more than one location, you’ll choose these settings separately for each of them. Enter the TE Account Number for this school. If you have more than one location using Tuition Express, it is likely that each will have its own TE Account Number. Wish to Allow Batch Comments. For non-Cloud customers only. Want to Automatically Sync Account Balances (recommended for non-Cloud customers). Select the Charge/Credit Descriptions you wish to use for each item, such as ACH Payment, ACH Payment Return, ACH Return Fee, etc. If you have not previously made these choices, the default descriptions (recommended) are pre-entered for you. Note: If the item says CREATE NEW DESCRIPTION, it means that description does not currently exist and will be created for you (recommended); however, you may choose your own description from the dropdown list. Choose the Bank Account for Tuition Express deposits (used for Deposit Reports). Enter the Minimum Transaction Amount you want to collect through Tuition Express. If a family’s balance is below this amount, the balance will not be processed. Optional: Click Install Enrollment Forms (bottom left), choose the forms you’ll use and click Install. These forms will be available within Letter Merge to print or email to families. Hint: You only need to install the forms once, even if you have multiple locations. At the Tuition Express Configuration Assistant screen, click Update (bottom right). If you have additional locations using Tuition Express, repeat step 3 to set them up. When finished, click Exit.